After four consecutive years of growth, global FDI inflows rose in 2007 by 30% to reach $1,833 billion, well above the previous all-time high set in 2000. Despite the financial and credit crises, which began in the second half of 2007, all the three major economic groupings – developed countries, developing countries and the transition economies of South-East Europe and the Commonwealth of Independent States (CIS) – saw continued growth in their inflows (table 1). The increase in FDI largely reflected relatively high economic growth and strong corporate performance in many parts of the world. Reinvested earnings accounted for about 30% of total FDI inflows as a result of increased profits of foreign affiliates, notably in developing countries. To some extent, the record FDI levels in dollar terms also reflected the significant depreciation of the dollar against other major currencies. However, even measured in local currencies, the average growth rate of global FDI flows was still 23% in 2007. FDI inflows into developed countries reached $1,248 billion. The United States maintained its position as the largest recipient country, followed by the United Kingdom, France, Canada and the Netherlands (figure 1). The European Union (EU) was the largest host region, attracting almost two thirds of total FDI inflows into developed countries. 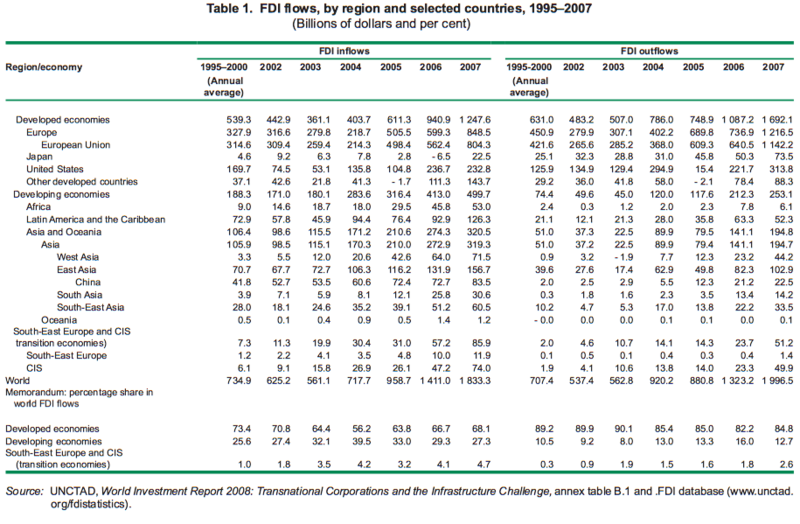 In developing countries, FDI inflows reached their highest level ever ($500 billion) – a 21% increae over 2006. 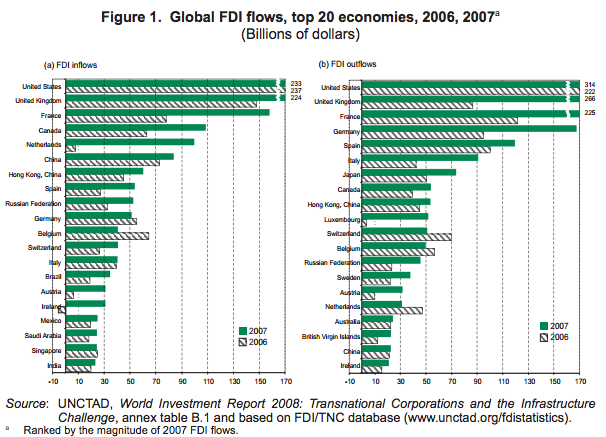 The least developed countries (LDCs) attracted $13 billion worth of FDI in 2007 – also a record high. At the same time, developing countries continued to gain in importance as sources of FDI, with outflows rising to a new record level of $253 billion, mainly as a result of outward expansion by Asian TNCs. FDI inflows into South-East Europe and the CIS also surged, increasing by 50%, to reach $86 billion in 2007. The region has thus seen seven years of uninterrupted growth. Outflows from this region similarly soared, to $51 billion, more than twice the 2006 level. Among developing and transition economies, the three largest recipients were China, Hong Kong (China) and the Russian Federation. …driven by record values of cross-border M&As. Continued consolidation through cross-border mergers and acquisitions (M&As) contributed substantially to the global surge in FDI. In 2007, the value of such transactions amounted to $1,637 billion, 21% higher than the previous record in 2000. Thus, overall, the financial crisis, starting with the sub-prime mortgage crisis in the United States, did not have a visible dampening effect on global cross-border M&As in 2007. On the contrary, in the latter half of 2007 some very large deals took place, including the $98 billion acquisition of ABN-AMRO Holding NV by the consortium of Royal Bank of Scotland, Fortis and Santander – the largest deal in banking history – and the acquisition of Alcan (Canada) by Rio Tinto (United Kingdom). The production of goods and services by an estimated 79,000 TNCs and their 790,000 foreign affiliates continues to expand, and their FDI stock exceeded $15 trillion in 2007. UNCTAD estimates that total sales of TNCs amounted to $31 trillion – a 21% increase over 2006. The value added (gross product) of foreign affiliates worldwide represented an estimated 11% of global GDP in 2007, and the number of employees rose to some 82 million (table 2). The universe of TNCs is expanding. 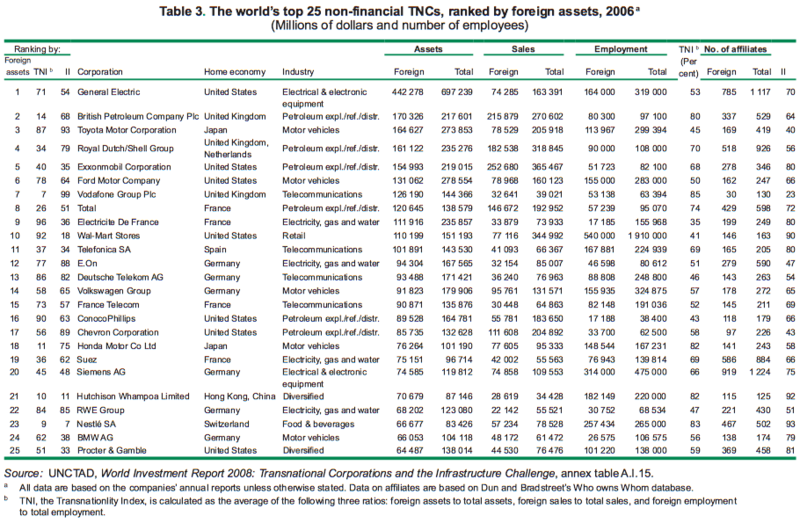 Manufacturing and petroleum companies, such as General Electric, British Petroleum, Shell, Toyota and Ford Motor, retain some of the top positions in UNCTAD’s ranking of the 25 largest non-financial TNCs in the world (table 3). However, TNCs in services, including in infrastructure, have become increasingly prominent during the past decade: 20 of them featured among the top 100 in 2006, compared with only 7 in 1997. The activities of the 100 largest TNCs increased significantly in 2006, with foreign sales and foreign employment almost 9% and 7% higher respectively, than in 2005. Growth was particularly high for the 100 largest TNCs from developing countries: in 2006, their foreign assets were estimated at $570 billion – a 21% increase over 2005. Their countries of origin have changed little over the past 10 years, with companies from East and South-East Asia dominating the list of the top 25 such TNCs (table 4). 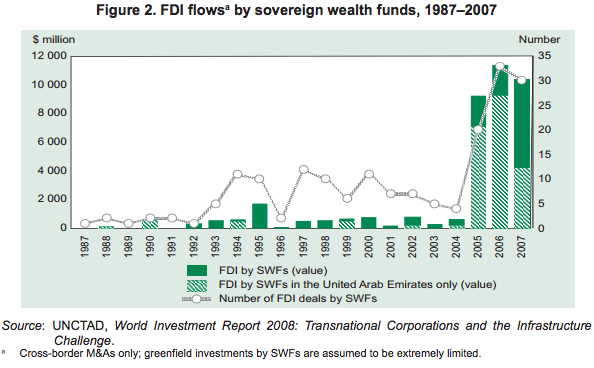 ….while sovereign wealth funds are emerging as new actors on the FDI scene. A new feature of global FDI is the emergence of sovereign wealth funds (SWFs) as direct investors. Benefiting from a rapid accumulation of reserves in recent years, these funds (with $5 trillion assets under management) tend to have a higher risk tolerance and higher expected returns than traditional official reserves managed by monetary authorities. Although the history of SWFs dates back to the 1950s, they have attracted global attention only in recent years following their involvement in some large-scale cross-border M&A activities and their major capital injections into some troubled financial institutions in developed countries. While the amounts invested by SWFs in the form of FDI remain relatively small, they have been growing in recent years (figure 2). Only 0.2% of their total assets in 2007 were related to FDI. However, of the $39 billion investments abroad by SWFs over the past two decades, as much as $31 billion was committed in the past three years. Their recent activities have been driven by the rapid build-up of reserves generated by export surpluses, changes in global economic fundamentals and new investment opportunities in structurally weakened financial firms. Almost 75% of the FDI by SWFs has been in developed countries, with investments in Africa and Latin America very limited so far. Their investments have been concentrated in services, mainly business services. Investments by SWFs in the banking industry in 2006-2007 were generally welcomed, owing to their stabilizing effect on financial markets. However, they also prompted some negative public sentiment, with calls to impose regulatory restrictions on investments by these funds, notably on national security grounds. International institutions, such as the International Monetary Fund (IMF) and the Organisation for Economic Co-operation and Development (OECD), are in the process of establishing principles and guidelines relating to FDI by SWFs. Most national policy changes continued to encourage FDI, though less favourable measures became more frequent. Despite growing concerns and political debate over rising protectionism, the overall policy trend remains one of greater openness to FDI. UNCTAD’s annual survey of changes in national laws and regulations that may influence the entry and operations of TNCs suggests that policymakers are continuing in their efforts to make the investment climate more attractive. 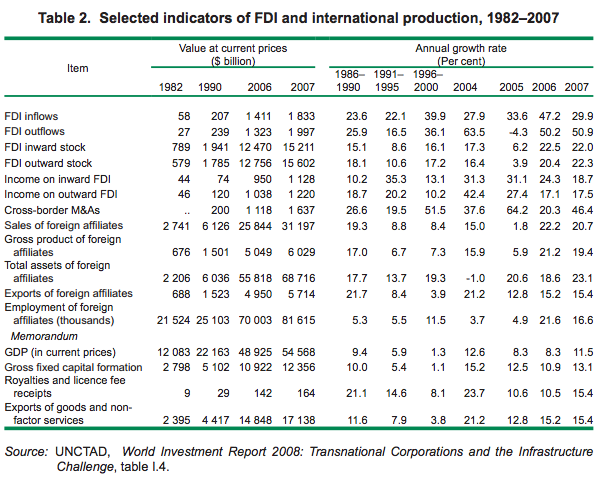 In 2007, of the almost 100 policy changes identified by UNCTAD as having a potential bearing on FDI, 74 aimed at making the host country environment more favourable to FDI (table 5). However, the proportion of changes that were less favourable to FDI has been increasing over the past few years. As in 2006, most of the new restrictions introduced were concentrated in the extractive industries, particularly in Latin America (e.g. Bolivia, Ecuador and the Bolivarian Republic of Venezuela), but they were also apparent in other countries as well. Several governments, including those of the United States and the Russian Federation, adopted stricter regulations with regard to investments in projects that have potential implications for national security. Government concerns also appear to be directed towards investments in certain infrastructure areas and those undertaken by State-owned entities. The number of international investment agreements (IIAs) continued to grow, reaching a total of almost 5,600 at the end of 2007. There were 2,608 bilateral investment treaties (BITs), 2,730 double taxation treaties (DTTs) and 254 free trade agreements (FTAs) and economic cooperation arrangements containing investment provisions. The shift in treaty-making activity from BITs towards FTAs continued, as did the trend towards renegotiation of existing BITs. The global financial crisis had a limited impact on FDI flows in 2007, but will begin to bite in 2008. The sub-prime mortgage crisis that erupted in the United States in 2007 has affected financial markets and created liquidity problems in many countries, leading to higher costs of credit. However, both micro- and macroeconomic impacts affecting the capacity of firms to invest abroad appear to have been relatively limited so far. As TNCs in most industries had ample liquidity to finance their investments, reflected in high corporate profits, the impact was smaller than expected. At the macroeconomic level, developed-country economies could be affected both by the slowdown of the United States economy and the impact of the turmoil in the financial markets on liquidity. As a result, both inflows to and outflows from these countries may decline. On the other hand, relatively resilient economic growth in developing economies may counteract this risk. In addition to the credit crunch in the United States, the global economy was also affected by the significant depreciation of the dollar. While it is difficult to isolate the effects of exchange rate changes from other determinants of FDI flows, the sharp weakening of the dollar helped to stimulate FDI to the United States. European FDI to the United States was spurred by the increased relative wealth of European investors and reduced investment costs in the United States. Moreover, companies exporting to the United States have suffered from the exchange rate changes, which have induced them to expand local production in the United States. This is illustrated by changes in the strategy of several European TNCs, particularly carmakers, that plan to build new or expand existing production facilities in that country. The slowdown in the world economy and the financial turmoil have led to a liquidity crisis in money and debt markets in many developed countries. As a result, M&A activity has decelerated markedly. In the first half of 2008, the value of such transactions was 29% lower than that in the second half of 2007. Corporate profits and syndicated bank loans are also declining. Based on available data, estimated annualized FDI flows for the whole of 2008 are expected to be about $1,600 billion, representing a 10% decline from 2007. Meanwhile, FDI flows to developing countries are likely to be less affected. UNCTAD’s World Investment Prospects Survey, 2008–2010, while also suggesting a rising trend in the medium term, points to a lower level of optimism than was expressed in the previous survey, and to more caution in TNCs’ investment expenditure plans than in 2007. In Africa, high commodity prices and rising profitability attracted FDI. In Africa, FDI inflows grew to $53 billion in 2007 – a new record. Booming commodity markets, rising profitability of investments – the highest among developing regions in 2006-2007 – and improved policy environments fuelled inflows. LDCs in Africa also registered another year of growth in their FDI inflows. A large proportion of the FDI projects launched in the region in 2007 were linked to the extraction of natural resources. The commodity price boom also helped Africa to maintain a relatively high level of outward FDI, which amounted to $6 billion in 2007. Despite higher inflows, Africa’s share in global FDI remained at about 3%. TNCs from the United States and Europe were the main investors in the region, followed by African investors, particularly from South Africa. 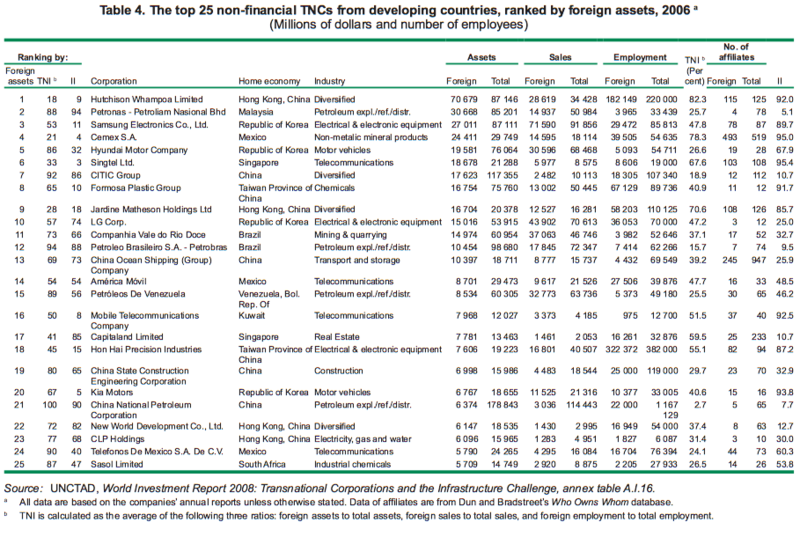 TNCs from Asia concentrated mainly on oil and gas extraction and infrastructure. Prospects for increased FDI inflows in 2008 are promising in light of the continuing high prices of commodities, large projects already announced for that year and forthcoming payments from previously concluded cross-border M&As. This will signify a fourth consecutive year of FDI growth. The UNCTAD survey shows that almost all TNCs have maintained or even increased their current levels of investment in Africa. In South, East and South-East Asia and Oceania, both inward and outward FDI flows rose to their highest levels ever. FDI flows to South, East and South-East Asia and Oceania were also higher than ever before, reaching $249 billion in 2007. Most subregions and economies, except Oceania, received higher inflows. A combination of favourable business perceptions, progress towards further regional economic integration, improved investment environments and country-specific factors contributed to the region’s performance. China and Hong Kong (China) remained the two top destinations within the region as well as among all developing economies. Meanwhile, India – the largest recipient in South Asia – and most member countries of the Association of Southeast Asian Nations (ASEAN) also attracted larger inflows, as did post-conflict countries and Asian LDCs, such as Afghanistan, Cambodia, Sri Lanka and Timor-Leste. Overall, prospects for new FDI to the region remain very promising. Sustained economic growth, demographic changes, favourable business sentiments and new investment opportunities were among the main factors contributing to the region’s good performance in 2007, and they should continue to attract FDI in the near future. FDI outflows from South, East and South-East Asia also reached a new high, amounting to $150 billion, reflecting the growing importance of developing countries as outward investors. Intra- and inter-regional flows are a particularly important feature. But firms are investing in developed countries as well, not least through cross-border M&As. SWFs from the region have emerged as significant investors, contributing to the region’s rapidly growing outward FDI stock: this jumped from $1.1 trillion in 2006 to $1.6 trillion in 2007. FDI in West Asia rose by 12% to $71 billion, marking a new record and a fifth consecutive year of growth. More than four fifths of the inflows were concentrated in three countries: Saudi Arabia, Turkey and the United Arab Emirates, in that order. A growing number of energy and construction projects, as well as a notable improvement in the business environment in 2007, attracted FDI into members of the Gulf Cooperation Council (GCC). For example, Qatar experienced a significant rise in inflows – more than seven times higher than in 2006. FDI outflows from the region in 2007 increased for the fourth consecutive year, to $44 billion – nearly six times its level in 2004. The GCC countries (Kuwait, Saudi Arabia, the United Arab Emirates, Qatar, Bahrain and Oman, in that order) accounted for 94% of these outflows, reflecting in part their desire to diversify away from oil and gas production through investments by SWFs. Intraregional FDI was significant, particularly from oil-rich countries, as confirmed by a growing number of greenfield projects and the increasing value of cross-border M&As. FDI inflows into West Asia are expected to rise in 2008, as countries in the region have remained largely unaffected by the sub-prime mortgage crisis, and a significant number of intraregional investment projects are in the pipeline. Latin America and the Caribbean saw inflows rise by 36% to a historic high of $126 billion. The increase was the highest in South America (66%), where most of the $72 billion worth of inflows targeted the extractive industries and natural-resourcebased manufacturing. Inflows to countries in Central America and the Caribbean (excluding offshore financial centres) increased by 30% to $34 billion, despite the economic slowdown in the United States. This resilience was partly explained by the dynamism of FDI in mining, steel and banking, which are not oriented primarily towards the United States market. FDI outflows from the region fell by 17% to $52 billion, mainly reflecting a return to more “normal” levels of outward investment from Brazil. Latin American TNCs, mainly from Mexico and Brazil, continued to internationalize, competing for leadership in such industries as oil and gas, metal mining, cement, steel, and food and beverages. In addition, many new Latin American companies began emerging in new sectors such as software, petrochemicals and biofuels. In the extractive industries, in which FDI increased as a result of the high commodity prices, the picture differed between oil and gas and metal mining. In metal mining, the scope for inward FDI is greater, as there are no major State-owned companies in the region, except Codelco in Chile. In oil and gas, by contrast, the dominant position, or even exclusive presence, of State-owned oil and gas companies limits the opportunities for foreign investors. This situation was accentuated in 2007, as a number of countries, including Bolivia, the Bolivarian Republic of Venezuela and Ecuador, adopted policy changes to increase taxation and further restrict or prohibit foreign investment in oil and gas. FDI to and from Latin America and the Caribbean is expected to increase further in 2008. Inflows would be driven mainly by South America, where high commodity prices and strong subregional economic growth should continue to boost TNCs’ profits. However, the level of future inflows into Central America and the Caribbean is uncertain, as the slowdown of the United States economy and a weak dollar could adversely affect their export-oriented manufacturing activities. Outflows are expected to be boosted by TNCs in Brazil and Mexico, which have already announced ambitious investment plans for 2008. FDI to and from South-East Europe and the Commonwealth of Independent States maintained an upward trend and set new records. As in most other regions, FDI flows to and from South-East Europe and the CIS reached unprecedentedly high levels. Inward FDI rose for a seventh consecutive year, to reach $86 billion – 50% more than in 2006. In the CIS, these inflows were mainly attracted to fast growing consumer markets and natural resources, while those to South-East Europe were associated with privatizations. Inward FDI in the Russian Federation increased by 62%, to $52 billion. Outward FDI from South-East Europe and the CIS amounted to $51 billion, more than double its 2006 level. FDI from the Russian Federation – the main source country in the region – soared to $46 billion in 2007. Russian TNCs have extended their reach to Africa with the aim of increasing their raw material supplies and their access to strategic commodities. These are needed to support their efforts to increase their downstream presence in the energy industry and their value-added production activities in the metals industry of developed countries. Whereas most of the national policy changes of the transition economies in 2007 were in the direction of greater openness to FDI, some CIS countries continued to introduce restrictions in the extractive industries and some other strategic industries. The Russian Federation approved the long-discussed Strategic Sector Law, which specifies industries in which foreign investors are allowed only minority participation. In Kazakhstan, a newly approved natural resources law allows the Government to change existing contracts unilaterally if they adversely affect the country’s economic interests in the oil, metal and mineral industries. Nevertheless, FDI flows are expected to be buoyant in these two countries as well as Ukraine. In developed countries FDI inflows and outflows appear to have peaked. Despite concerns over the economic uncertainty faced by some developed economies, FDI inflows to developed countries as a whole surged by 33% in 2007, to reach $1,248 – yet another record. The rise was mainly driven by cross-border M&As, but also by reinvested earnings as a result of high profitability of foreign affiliates. The United States retained its position as the world’s largest FDI recipient country. The restructuring and concentration process in the enlarged common market of the EU countries led to a renewed wave of cross-border acquisitions. Large FDI flows to the United Kingdom, France, the Netherlands and Spain drove overall FDI inflows to the EU to $804 billion – a 43% increase. Japan’s FDI inflows grew strongly for the first time since the end of the 1990s. Developed countries maintained their position as the largest net outward investors, as outflows soared to a record $1,692 billion – $445 billion. The largest outward investors – the United States, the United Kingdom, France, Germany and Spain (in that order) – accounted for 64% of the total outward FDI of the group. The policy environment for FDI in a number of developed countries continues to be one of greater openness, with some exceptions. There are, however, growing concerns over the possible negative effects of cross-border investments by SWFs, as well as private equity and hedge funds. FDI to and from developed countries is expected to fall because of the dampening effects of the financial market crisis, combined with weaker economic growth in these economies. The value of cross-border M&As in developed countries fell considerably in the first half of 2008, compared with the second half of 2007. In UNCTAD’s World Investment Prospects Survey 2008–2010, 39% of the responding TNCs anticipated an increase in FDI inflows into developed countries compared with more than 50% in last year’s survey. Global FDI flows surpassed the peak of 2000… ...driven by record values of cross-border M&As. The largest TNCs pursued further expansion abroad… ….while sovereign wealth funds are emerging as new actors on the FDI scene. Most national policy changes continued to encourage FDI, though less favourable measures became more frequent. The global financial crisis had a limited impact on FDI flows in 2007, but will begin to bite in 2008. In Africa, high commodity prices and rising profitability attracted FDI. In South, East and South-East Asia and Oceania, both inward and outward FDI flows rose to their highest levels ever. West Asia also saw record flows in both directions… … while the surge of FDI into Latin America and the Caribbean was mainly driven by the demand for natural resources FDI to and from South-East Europe and the Commonwealth of Independent States maintained an upward trend and set new records. In developed countries FDI inflows and outflows appear to have peaked.